Hasty jersey modifications are a proud Toronto tradition, dating back to when people taped VINCE WHO? over their Carter jerseys, and before that to when fans taped YOU ARE A MISCREANT, SIRRAH! to their Huskies jerseys way back in olden times. 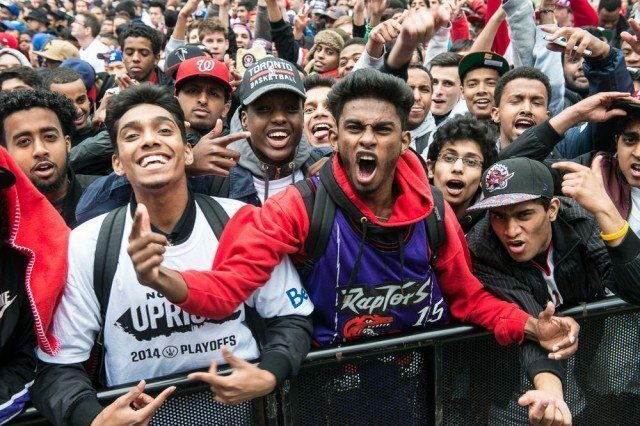 Friday night at Maple Leaf Square outside the Air Canada Centre—or, as TSN has tried to coin as a catchphrase, “Jurassic Park”—the place was jammed full of Toronto Raptors fans hoping to see the Raps complete a first-round victory over the suddenly despised Brooklyn Nets. Sadly, this was not to be, as the referees the Nets beat the Raptors 97-83, handing Toronto its most stinging loss in this post-season so far, and sending fans home—at least until Game 7 at the Air Canada Centre on Sunday afternoon at 1 p.m. (in case you were thinking about attending). In any case, Raptors fans came out en masse to support their team, watch the game on the big screen, yell slogans, and try to get free mercy from the Raptor and MLSE staff. And Torontoist came out to see it happen. CORRECTION: May 4, 2014, 8:24 AM This post incorrectly identified a man in one of the image gallery photographs as Cabbie Richards. We regret the error.